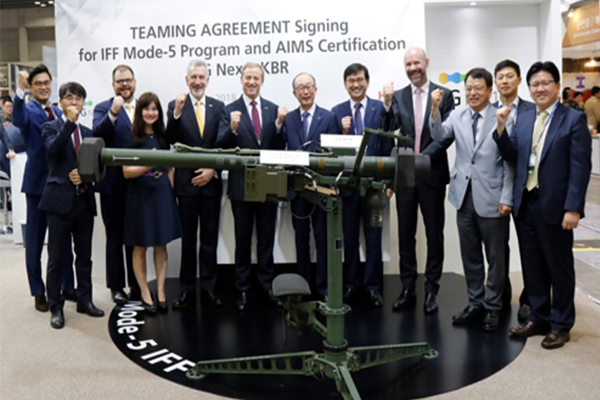 LIG Nex1, a South Korean aerospace manufacturer and defense company, announced on Thursday it has signed an agreement with U.S.-based KBR to jointly gain the AIMS certification from the U.S. Department of Defense for IFF (Identification Friend or Foe) Mode 5 implementations on new Korean military arms. AIMS is a military acronym for an air traffic control radar beacon system for identification and IFF technology enabling military users to quickly distinguish between allied forces and potential threats to avoid friendly fire. IFF Mode 5 is the most recent implementation of the system. Korea is launching a project to upgrade its current identification system to Mode and demands the U.S. Defense Department clearance. KBR is a global system integration, test, evaluation, and system certification agency with proven track records in IFF Mode 5 projects. Under the partnership with KBR, LIG Nex1 will receive technical assistance needed for AIMS certification on the IFF Mode 5 upgrade in areas of aviation, local defense, regional defense, surveillance and reconnaissance, and warships. Since 2016, LIG Nex1 has led localization projects in connection with performance improvement of Korean IFF equipment for many military systems, including those for its KP-SAM Shin-Gung, a shoulder-launched surface-to-air missile.